However, it makes a whole lot of difference when you have a lifelong ally who is ready to fight for you — anytime and anywhere. And this is not simply to rescue from harm, but to be present next to you. When life throws a punch at Ae Ra, Dong Man will be there to mend the hurt in case he missed to block it. Or better yet, they can sit together and eat kimbap all night with chicken feet and soju on the side. Regardless of what people say, you’ll make it! 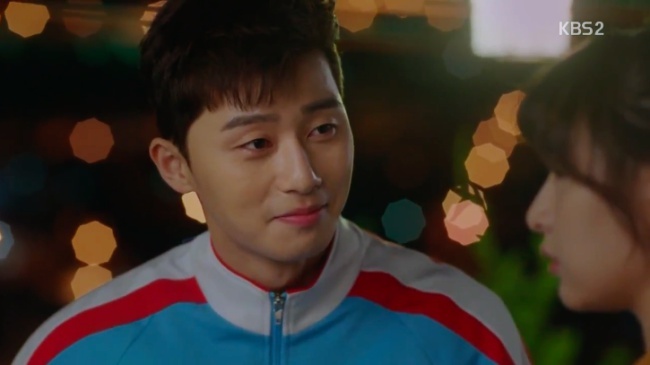 Go Dong Man (Park Seo Joon) is vulnerable and his self-esteem is at its lowest. While Choi Ae Ra (Kim Ji Won) tries hard to keep her chin up high. It’s a contradiction that they compliment so well. Whenever Dong Man feels down, Ae Ra’s natural optimism pierces through him. I’m so glad we are not going to get a prince out of Dong Man, nor a hero because Ae Ra isn’t a damsel in distress. Instead, we have a feisty woman that exudes Ae Ra’s beauty from within. And Dong Man just needs to find his heart back, stand up, move on and become a reliable man. He isn’t as lame as he thinks. Their 20 years history together is remarkable. Only time can allow one to discover foibles and strengths that can still be accepted despite the constant change. It’s nice to see that Ae Ra could naturally break down and weep in front of Dong Man while she never budged with anyone else. And Dong Man’s power comes out when Ae Ra is at her weakest. The first two episodes showed us how they co-exist, no matter the challenge, they fight for one another. That said, something familiar can be a huge stumbling block to tell the difference between love and friendship. They live only steps away, seeing each other in the morning with bed hair is a norm. Everyday feels the same. Is there anything left to discover? I don’t know how they managed to remain their own 6 years old self all this time. They feel like a kid, it shows in so many ways. The innocence and bravado only a child bears, they still carry it like a baby fat trapped in a body. It is so adorable! Their dynamic feels different because of this child-like persona. They need to shed this off tho, and take a closer look at their present. Coz if they continue to see their 6-year-old self who promised not to marry one another, how can they realise that, truth be told, forever already exist in them. It makes me more curious. There must have been an incident that happened while drinking soju and chicken feet in the past. They use alcohol like an obstruction of some sort. Whenever Dong Man tries to open up, almost to confess, the alcohol joke comes in to hide what he really means to say. 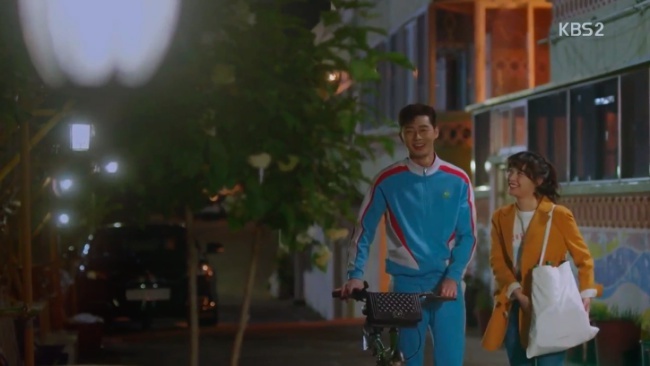 I don’t blame Ae Ra for asking him questions like, “Why would my heart flutter over you?.” Whenever this happens, Dong Man sways on the opposite direction and our girl joins him there while feeling bemused inside. Of course, there is also a possibility that Dong Man is clueless of his own feelings for Ae Ra. But the way he looks at her during those moments, I can’t help but think otherwise. This innate chemistry between best of friends still sends my heart into a frenzy. I know its early to tell whether I’m right or wrong. Seeing how Dong Man and Ae Ra lives, they still have issues that are just starting to shape them. True, they are living a mediocre life. Their salaries are not at par with what society dictates. But I love that they still share what they have with each other, and it goes beyond money. When Dong Man bought a bag and pair of shoes for Ae Ra, it showed me a sweet man who gives generously. It made the gesture more valuable than the bag actual price tag. And seeing how Ae Ra cherishes it, brings warmth to my heart. Now, how can this not be love? The irony of life is sometimes we can’t see what is already in front of us. And we continue looking in the wrong place! But with this two together, I don’t think I mind if they take much time to find their self first. Coz their love for each other won’t go anywhere, anyway. I had put off watching this but I’m so glad I started. Their chemistry for me was fireworks. Really looking forward to how the storyline will go. Reminds me of Bubblegum in a way, minus all the drama.